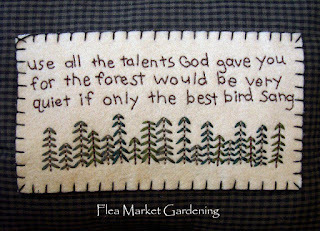 Searching for inspiration to spark a New Year’s blog post I came across these words stitched on fabric: “Use all the talents God gave you for the forest would be very quiet if only the best bird sang.” Being a person who drags around a lot of guilt for wasting time and my minor league talents, those words struck a chord. I’m good at hiding my voice in the shower because it isn’t as good as someone else’s. I’m not talking about actual singing talent, of course. I left that aspiration back in high school before years of asthma and old age came into play. Now I have trouble singing anything that doesn’t hurt my ears and send the dog off to another room. I’m talking about what I perceive as my God given talents and how I take them for granted. And don’t we all? Please tell me I’m not the only one. So instead of New Year’s Resolutions I’m cataloging my talents and vowing to appreciate and use them more in 2019. 1) I’m good at organizing things whether it’s a basket full of nuts, screws and washers or a complicated family genealogy book or---back in the day---flowers for a country club wedding with 500 guests. I can see the big picture and making sense out of all the snippets that feed into it. So how do I plan to put this talent to work in 2019? I'm starting with a walk-in closet I can barely walk into anymore. It needs a major purging of things I’ve been holding onto because my weight bounces all over the place. I’m afraid to let go of things that are too big or too small and please tell me why I’m holding on to worn out things that fit! It’s not like I don’t have the money to buy new clothing. Ohmygod, I wanted to write some New Year’s Resolutions that didn’t include the classic weight related ones and the first thing I put down on my bullet point list took me right to that place! 2) Painting. I’ve struggled with low self-esteem issues for years when it comes to not having enough talent to be another John Singer Sargent, portrait artist extraordinaire. But I do have some talent. So maybe it’s time for me to join the realm of backup singers, so to speak, who approaches art for the shear fun of dabbling. Maybe it’s time to change the style I’ve been working towards since my teens and go for something that frees what talent I do have to go where it’s never been before…abstract, funky, sideways...anywhere but in an upward trajectory towards a discipline I’ll never achieve. 3) Handcrafts: knitting, quilting and sewing. I still knit and still enjoy it and I definitely have/had a talent for sewing. I took tailoring classes back in college and actually made men's lined suit jackets that looked every bit as good as any you’d find in high end stores. I was a great seamstress but I lost my interest in sewing somewhere in the '80s when free time was harder to come by and we played dress-up less and less often. In the past decade I tried to revive my once-love of sewing by taking a class on quilting but I was bored quilting using a sewing machine. I’ve since made a couple of quilts entirely by hand, which was akin to meditation that I loved doing, but I’m losing my finger dexterity so I’ve hesitated taking on another quilt project. For 2019 I hope to find a couple of handcraft projects that inspires me. And if I don’t I’ll know by the end of the year that it’s time to cut my losses and run from my past successes. 4) I have a talent for long range planning, if you want to call it a talent. Some would call it a boring way to live but it’s served me well and it’s a skill that I couldn’t shake if I wanted to, having been raised by depression era parents who both knew what it was like suffer hardships. With that in mind, I took the DNA health test from 23andMe and the results should be coming the first part of January. I read somewhere that only 10% of the population wants to know if they have the gene markers for the health conditions the test reveals including Alzheimer’s. But isn’t knowing just an extension of gathering facts for long range planning? I might regret the decision because once you look at the test results you can’t un-see them and they say it affects you in ways that you can’t predict. For me, I think if I have the marker for Alzheimer’s I’d either obsess with estate planning or want to cram as much fun stuff into my life as I could while I can still remember doing it, which begs the question why don’t I do that now without knowing my health future? I could get hit by bus tomorrow---well except for the fact that there isn’t any bus service here in the suburbs where I generally roam. But you get the point. This entry was published a day earlier than my usual schedule so I could wish you all a Happy New Year! See you again on Saturday. Jean--Thank you for the quote: I've never heard it before, and I like it very much. You have a lot of talents that could/should keep you happily busy and content in 2019 and beyond. Even if you pick just one or two, you'll be Singing along in your Forest with plenty to show for it. I've never heard the quote before either, but it sure has a joyful message. We all have our talents, but most of the time was take them for granted and New Years Day is a great day to take stock of them. Love that quote and it is so true. Well you will definitely liven up the forest. Now I have to think of what noise I can contribute. Thanks for the nudge. The more I think about that quote the deeper it gets. One singer in the forest would be sad and lonely without the choir. And how would we know which bird was the best singer without the others? And who judges what is good and what is not? I love the Blog Forest and hope we all who play here will play harder and more often. You! Love the quote and your synopsis of talents. What an inspiring post! I'm gonna take a page from your book (or a post from your blog?) and do the same cataloging of talents and see if I can appreciate myself more and use my gifts in more creative ways. Thank you! Here's to a healthy, happy, joyful, peaceful new year. Can't wait to see what you come up with. Don't forget to include your passion and commitment to working towards bringing about the changing we need this country. It's truly a gift to be able to be so devoted to a cause. That is the perfect quote! My resolution is to move more, screen less! That's a resolution I SHOULD be making. The closest I got to that is to vow to resume a seven minute 'dog dance' routine each night with Levi. That's such an inspiring quote. I Do like that! A lot! And I love what you wrote. Thanks for your holiday visits to my blog. So very glad to have discovered you after so many years just seeing a name on someone else's post! Here's to a great and productive new year! You are such a joyful 'doer' of arts, crafts, cooking, photo-documenting and socializing that you inspire me. I'm glad 2018 connected us through blogging. That imagine of only one bird singing in a forest does makes it's point well, doesn't it. Wonderful quote, Jean. I've never heard that one. Please sing on and often in the Blog Forest! Love your goals. Happy 2019! I just now finished reading your 'intentions' for 2019. We were both visiting each other at the same time. Best of luck for both of us holding firm all year long. I love the quote, and it applies very directly to me. This fall, I made it a project to audition for a solo in my choral group's holiday concert. I loved the music (a Polish lullaby), and I worked and worked on preparing that music. In the end, though, it was not ready for prime time. Now I need to admit that my soloist days are long over and adjust my ego to being one of the choir. Happy New Year to you, Jean. I'll be interested in seeing where your focus on your talents takes you in 2019. Having the guts and commitment to go after a soloist part when you hadn't been singing right along is no small feat. I'm sorry you didn't get the part but what you did is still amazing. Something tells me your ego will adjust nicely in the choir. I think one of the things we gain by trying any thing with all our hearts is we gain an appreciation those who are truly talented. I love your joke about the Soviet Union. I could have been one of your lieutenants. Right now I'm happily knitting a sweater. But what if God didn't give you a talent or two? I suffer from not having a talent. My husband has many. Friends who can sing, paint, photography. I can not do a damn thing. I have tried. I am living proof that not all people have talents or even one. I laugh well, but not a real talent sadly. Margaret don't ever underestimate your ability to make people laugh. You do it all the time with your blog writing and probably in person, too. That's a talent not every has. Happy New Year Jean. Guess what? I still can't get rid the yoga pants. LOL. I never did resolutions except one. Going on a cruise. My thoughts were always thinking about remembering my blogger friends making sure to reading their blogs and maybe reading a new blog and meeting somebody new. Each day is a new day for me because I'm never sure what day God will take me away from this earth so each day is an exciting day. Mary Lou took out the luggage for our cruise. I'm very excited this morning. Jean, I pray that 2019 with give you good health and excitement and that you & I will continue to blog with each other. See ya my good friend. The luggage is at the airport! Wow, this cruise is getting very real! I hope you two have a fabulous time, but I know you will...they don't call you cruis' Paul for nothing. What a great way to start out the new year. I play in a band that is part of an international organization started about 25 years ago to encourage older adults to learn music or return to instruments that they hadn’t played for many years. The motto of the organization is “your best is good enough”. That is, in one sense, similar to the quote you posted: in both we are invited to be a part of something larger, each bringing their own talents. It is the diversity that is really important. I think, sadly, we too often focus on the best, the most talented or the highest achiever. I am more interested in the middle because I seriously believe that there is rich talent all along the spectrum and only focusing on one loses so much. So much of what I just said is because I am not the best in anything and never was. Convincing ourselves that we have an important voice as well is where I am standing. This is who I am and I have a voice too. I love what you wrote how we focus too often on the best...When we think about how very few people are the very best of any craft, talent field or whatever that leaves a ton of people in the middle whose efforts go unappreciated. And I love that motto for the international organization. It inspires fun in relearning something you once loved. 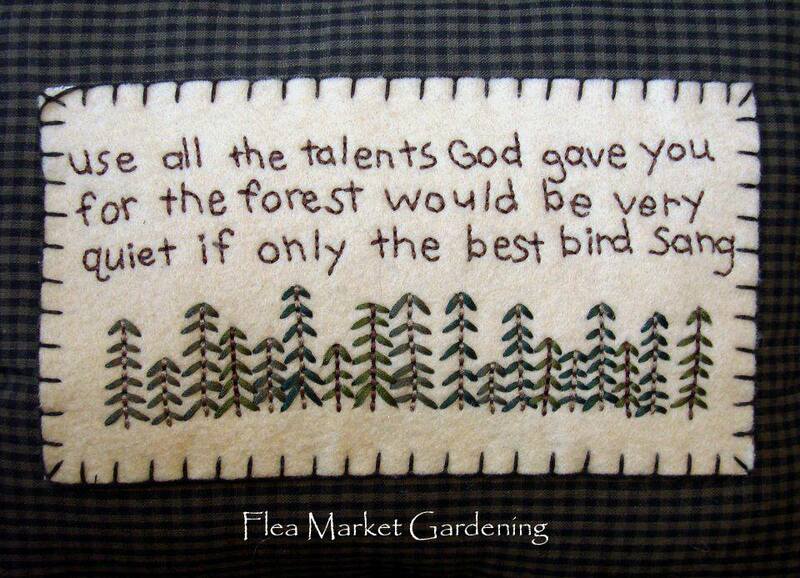 Good quote to make the best of whatever talents we have or exploring new ones we think we might have or wish we did. We never know whatever our age. I think if we derive pleasure from the activity that’s all that matters. If anyone else is pleased by what we do then that’s icing on the cake. Maybe you’ll just want to dabble a bit in any of all those you enjoy as the mood strikes you with no need to pick just one. Dabbling without trying to improve is hard for me. I get the most pleasure from conquering whatever I try and going on to something new. Never been able to conquer painting.